In the last few months, I have blogged about a new level of communication between myself and my horse herd. All my life I dreamed of having the kind of relationship with horses that is portrayed in the Walter Farley Black Stallion series, or in The Man From Snowy River movie. Now I’m actually building that. Fun! Recently, I started having more confidence in the feedback I’ve been getting from the horses for a while. The more confidence I develop, the more clear and frequent the feedback is becoming. I had still sometimes failed to hear what they were saying, or struggled to hear clearly. 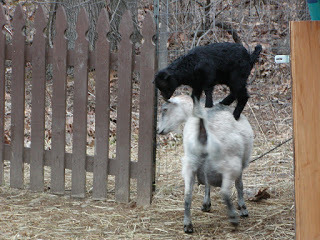 And I was only hearing the horses and goats, not my other animals (or so I thought). 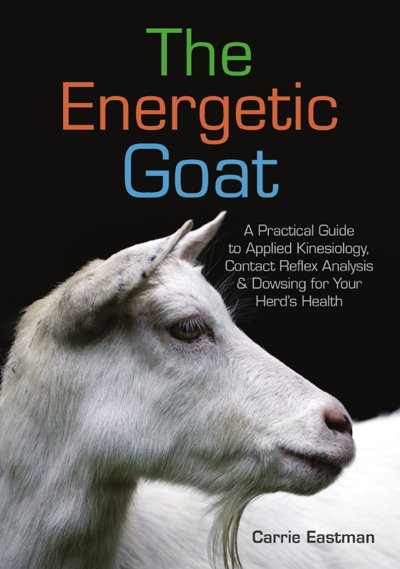 Around this same time, I got to chatting with Joan Ranquet about her new book Energy Healing For Animals and my own book The Energetic Goat. As we both wrote about similar topics, we decided to swap books. As a bonus, she also sent her book Communication With All Life. I picked up Communication and couldn’t put it down. The book answered many questions I have had about how I am getting these messages and how I can hear more clearly. 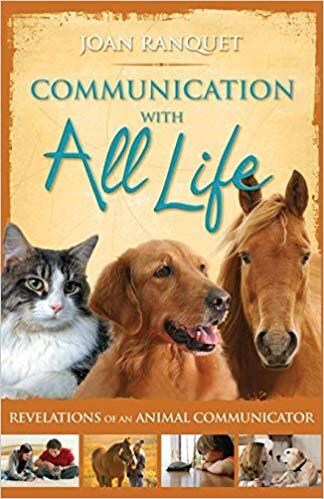 Joan blends in some real-life stories that gave me some great ideas for improving my relationship with my dogs, cats and other critters. I’m seeing the dogs differently now. Just reading a few short paragraphs shifted my entire perspective in a way that is hard to express, and has made a huge difference already in how the dogs and I interact. I realized I was putting mental “labels” on them, and they were living up (or down) to those labels. When I switched my “labels” to uphold their best qualities and best potential, they have started living up to that. A really good example is Dude. Dude is a mixed breed who should be very intelligent and thoughtful and calm. 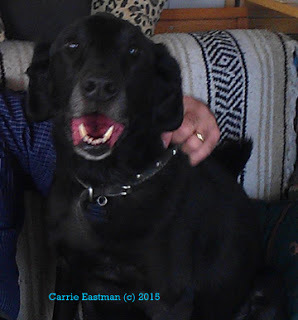 Historically, we have all thought of Dude as, well, a little slow, a little doppy, somewhat spastic and very goofy, and we talked to him and about him that way. His actions matched our thoughts. He was inconsistent, hyperactive especially when petted, and the most frequent trouble-maker. I am now complimenting him on his intelligence, sending calming energy when I pet him, and just appreciating him for being him. And he has calmed down and is listening to my requests much better, even able to leave the house off leash and return when called. He made that shift in behavior and energy the same day I changed my thoughts about him. Joan’s book is thoughtfully organized, covering the basics of how communication occurs, what communication looks and sounds and feels like, and how to set yourself up to succeed. She also included excellent information about building physical health, as healthy people and animals have stronger communication skills. Overall, I feel Joan’s book is a useful resource both for folks that are entirely new to communication and for folks that are already having the conversations and looking for ways to improve. The many anecdotes add entertainment as well as teaching. I found myself laughing and giggling quite a bit over the animal antics and messages. I highly recommend reading her book, preferably with your animals reading over your shoulder. You will all be entertained and learn something new. 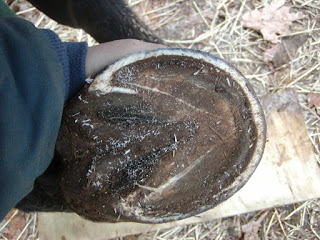 I'm a barefoot hoof trimmer, and the other day I realized that I'm always saying to horses, "Rest your foot on the hoof stand." I realized that the word "stand" detracts from the concept of "rest," so I started saying, "Rest your foot on the hoof rest." And by golly it seems to make a difference. I guess words have resonance, and even if the horse isn't logically thinking through that it's confusing to have to stand on your foot and rest it at the same time, nevertheless sending out the words "hoof rest" sends out a resonance more congruent with actually resting your foot. I really want to read that book you recommend – I'm just at the beginning stages of trying to communicate. I'm not sure how to communicate, so mostly I just use my words, and the animals (especially the horses) seem to understand. 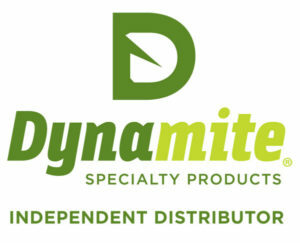 What I get from them is either a vague intuition or else something very direct and unmistakable. Like the other day I was trimming a mare who has trouble standing on three legs, and she kept pointedly turning her head all the way round to the right to indicate her quarters. I pointed this out to the owner, who said that she'd been badly kicked on her right haunches when she was a youngster, and there's still scar tissue in the muscle. Or when I asked one of our horses if he'd like a Skype conversation with an animal communicator to tell us about his past, he reached round and took hold of my cell phone (which was in my pocket) with his mouth. Thank you for this, I've heard of Joan Ranquet a few times now, and I will be ordering her book! I feel everyone can communicate, just need to get that 'inner cop' to stay quiet in our head. You know, the guy that keeps saying 'you can't do that' or 'that isn't what was said…really'. Great blog. Thanks. Thank you for your lovely feedback! Glad you are enjoying the blog. Please let me know if I can ever be of assistance.